Adam Tavel received the 2010 Robert Frost Award, and his forthcoming collections are The Fawn Abyss (Salmon, 2014) and Red Flag Up (Kattywompus, 2013), a chapbook of letter-poems. His recent poems appear or will soon appear in The Massachusetts Review, West Branch, Indiana Review, Zone 3, Cream City Review, Bayou, and The Cincinnati Review, among others. Tavel is an associate professor of English at Wor-Wic Community College on Maryland’s Eastern Shore. It’s significant that this poem is a letter, not a direct address, and that Annabelle isn’t named until the poem is nearly finished. Parenthood can be like that: the needs of the little person in your midst are so immediate, so consuming that time for anything else, including nurturing the love that inspired parenthood, runs scarce. It’s easy for the child to come between you. At the same time, though, the speaker knows caring for “our monster” is also caring for Annabelle; his impulse to record for her the wonders of their messy, smelly day is for reconnection. And in the silence just after the poem, the reader is wrapped, not in the drool soaked afghan, but in the depth of feeling that brought the speaker and Annabelle together. Which makes this the best sort of love poem: alive to the dirt and drama, but still in awe of the beloved. 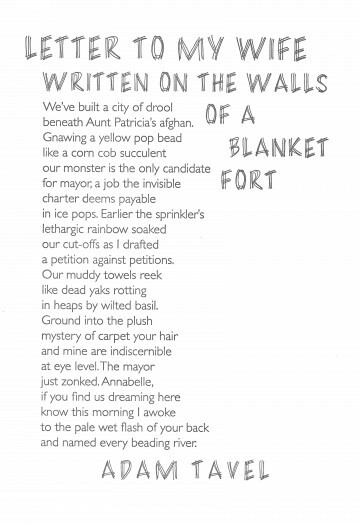 By definition, anything written on a structure as ad hoc as a blanket fort is itself even more ad hoc. The typeface, therefore, had to look hastily scratched but still legible enough to carry a long title. Filament has the look of chicken scratch gone over and over to make it darker and blocky, while Gill Sans appears to be the clearest, most regular strokes of Filament. None of it has much weight, and therefore might be obscured the moment someone walks by, shaking the walls.